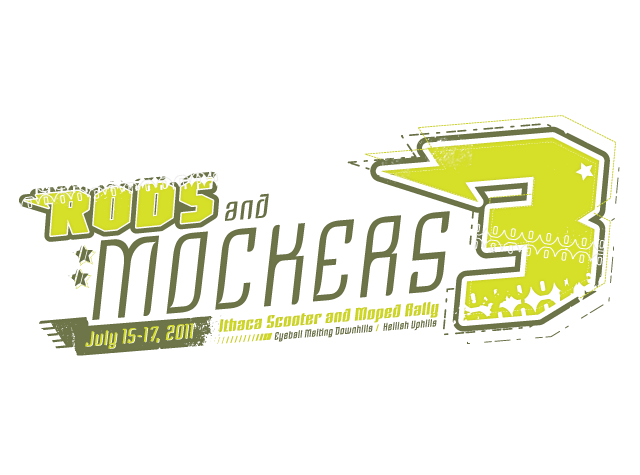 This is the third annual Scooter and Moped Rally brought to you by the Ithaca Scooter & Cycle Shop in Ithaca, NY. We’re hosting another summer gathering complete with a monster bonfire, yum bbq, loud music, and plenty of 2 wheelin’ fun! So clear out your schedule for the weekend of July 15th-17th this summer, and come to Ithaca! You can still register in person however for registrations received after July 10th there is no guarantee that one will receive a t-shirt. The cost is $40. What does this fee include? Arrive anytime, set-up camp, check-in for rally swag (pre-registrants) or register ($40) at Command Central. 6:00 pm and onwards, escorted trips to Meet and Greet for drinks at Felicia’s Atomic Lounge (508 West State St). 7:00-10:00 am, more arrivals, check-in for your rally goodies or register (pay-up). Coffee, juice and donuts will be provided. 10:00 am Trip to gas station. Please fuel up before the ride. We will stop for fuel in town after lunch. 10:30 am Faster scooter ride through Tompkins County. See some of our famous waterfalls (Taughannock Falls, Ithaca Falls) twisty downhills, Cornell Plantations. Scoots should be in good shape and be able to climb hills and maintain 45 mph on level ground. Mid-ride lunch stop downtown Ithaca Commons (on your own). Please Note: We will encounter some traffic and controlled intersections on route. Please maintain a close staggered formation and continue through red lights at the intersections where the Blockers are stopping traffic. 11:00 am Leisurely moped ride through Tompkins County. This ride is designed for small displacement scooters, mopeds and for those that prefer a more sedate ride. Similar waterfalls, twisty downhills, etc. Mid-ride lunch stop downtown at Shortstop Deli. 6:00 pm Dinner: RazorBack BBQ pulled pork or veggie provided. Raffle drawing, awards? Coffee, juice and donuts will be provided. Late morning moped ride for those standing up (scooters welcome). Usually whoever is left rides back into town to the Ithaca Farmers Market for a final outing...otherwise clean up, pack up, creep on outta here. Thanks and see ya’ll next year! Camping on-site is encouraged. Bring a tent, folding camp chairs, flashlight, sleeping bag, teddy bear, etc. This is a rain or shine event, check the weather before hand and prepare accordingly. If it’s gonna rain, it’s gonna RAIN. It’s Ithaca. Arrive at the meet and greet gassed up. Last year some jerk in a truck tried to run one of us off the road. Not everyone driving around is chill so ride smart and pay attention. There will be plenty of beer. There are hills everywhere. Be warned. Slow scooters are welcome to ride with the mopeds. Print out the map (when available) and bring it with you. We’re a tiny group, and some people will have fast mopeds, others slow... inevitably people will get separated. Ithaca is a small town and easy to find your way around. Bring the map. Please don’t burn down Anthony’s house. Directions: From Ithaca, take Rt. 96 North (toward the Hospital), turn left on Hayts Rd (just past the hospital). Stay on Hayts Rd for approx. 3 miles, past Hopkins Rd, past Sheffield Rd, past Van Dorn Rd, turn right on Sage. The shop is the 3rd building on the right. #47 is on the mailbox at the end of the driveway.